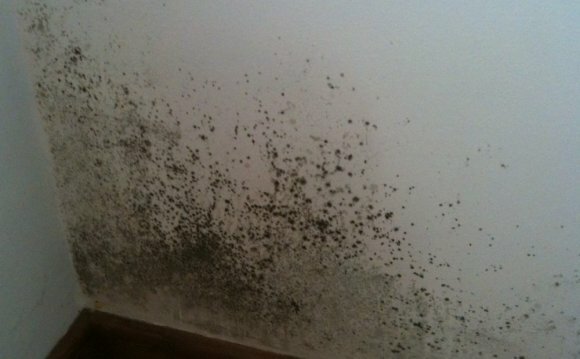 If the weather's been very humid for a few days in a row you might notice mold starting to grow in your home. When it rains for several days it's especially common to see mold start to grow on walls, benches and other surfaces because of the wet air. If you live where humidity in the air is naturally high, like by the coast or another large body of water, then mold growth in your home can also be a recurring problem. Also when moisture inside your house evaporates into the air it increases the humidity indoors. If your home isn't well ventilated then the humidity will stay high for a long time. Drying clothes indoors on clothes lines or stands is a common culprit when it comes to causes of indoor humidity problems. The household HVAC system can also create humidity troubles while it artificially heats or cools the air. Sometimes people use humidifiers in their homes. But there are molds that only need the humidity level to be higher than 55% to start growing. So if you need to use a humidifier in your home make sure to keep the humidity below 55%. Not only does high humidity feed mold, but it means that puddles of water and damp materials in the home take longer to dry out. These wet surfaces can in turn create mold growth of their own. Like some leaking pipes, a roof that leaks into the attic might not be discovered until it's already lead to mold growth. The best thing to do is to check the attic regularly for leaks and keep an eye on the ceiling below the attic. If you notice any signs of water damage on the ceiling or any mold that has grown through then you probably have a leaking roof. Cold surfaces can create condensation in your home. Condensation collects on cold metal pipes as well as on cold concrete floors, even if there is carpet over the top, and on walls. Places like these where condensation occurs are prime spots for mold growth. If your home is poorly ventilated it can create pockets of stagnant moist air which mold thrives in. Steam and water evaporating into the air creates humidity inside which then needs to be circulated outdoors through windows to keep the moisture level balanced. If you leave clothes wet for a long period of time in your house mold can grow on them as well as on other surfaces due to the moisture wet clothes release into your home. Damp clothes left in a pile waiting to be washed for more than a day can lead to mold growth. Clothes left wet for over a day after being washed may also end up fostering mold. Drying your clothes in a dryer instead of outside on the line releases a large amount of moisture into your home if the drier is not vented outside the house. Clothes drying inside on indoor clothes lines or racks will also create a build up of moisture inside unless the room is well ventilated. It is almost inevitable that some mold problems will develop after your home has been affected by flooding. Obviously your house will be very wet for a long time during a flood, taking days or even weeks to dry out. Since mold only needs a suitable surface to be wet for 24 hours before it can grow this means there is a huge risk of mold growth. Some dangerous toxic molds require more extreme conditions than common molds do, such as the toxic mold Stachybotrys chartarum which requires material to be very wet for several days to grow. A flood can create these conditions putting your home more at risk of being infested with dangerous toxic molds. Basements often contain higher amounts of moisture or humidity than other rooms because they are usually not well ventilated. Basements are also often colder meaning more condensation occurs which leads to dampness and humidity. Also any water from leaks in your home will often end up running down to the basement since it is lower than all the other rooms. Not only is mold more likely to grow in basements but because they are usually neglected mold growth may not be discovered until it is well set in. Water building up in the yard and ground around the base of your house can cause frequent water problems for the foundation of your home. If the ground around your home slopes towards the house rainwater will end up building up at the foundation. If this causes constant problems you might even need to do some landscaping to modify the slope of the ground so water drains away from the house. Alternatively ditches and drains can be dug to channel water away from the home. To find out more about how to prevent mold by fixing common mold causes visit.